Home country to the world’s second-richest man, Carlos Sim, Mexico has a market of more than 112m consumers, with a middle class in rapid growth and one of the highest annual HNWI growth rates. Thanks to its 40 free market agreements, Mexico is one of the most open economies on the planet and an ideal export platform to access two-third of the world’s GDP. Mexico is part of the North American Free Trade Agreement (NAFTA,) also known as the Tratado de Libre Comercio de America del Norte (TLCAN), the world’s major economic block with a market value of $17.3trn. 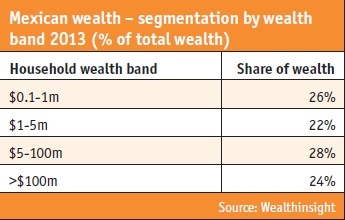 Mexico is currently home to 146,309 HNWIs who hold $801bn in wealth, according to PBI’s sister company WealthInsight. Helped by a stronger international profile and broadening range of investment opportunities, the Mexican market is becoming increasingly sophisticated. 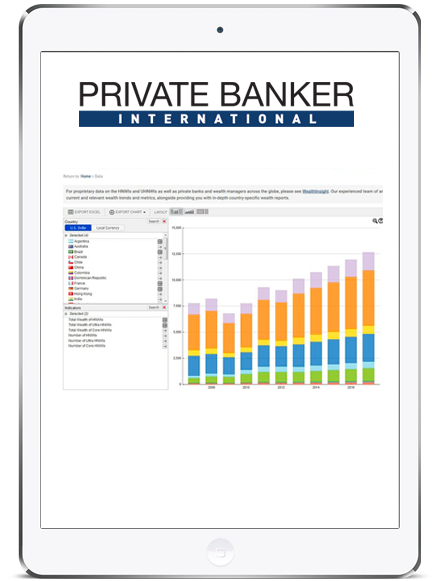 In 2013, many private banks in Mexico initiated Basel III, with Mexico being viewed as the most financially safe country in Latin America. As the Boston Consulting Group (BCG) suggests some wealth management players have also started to develop buy-side, open architecture offerings there. According to BCG estimates, Mexico has the second-highest onshore wealth share of 68%, with total household wealth of $1.06trn as of 2013. Mexico’s onshore business and broader overall offerings have especially evolved in the last few years. Private wealth rose by 10.7% in Mexico driven by the weakening of local bond and stock markets, says WealthInsight. With more than 70 branches in its private banking network and a total of 2,000 in the bank overall, BBVA Bancomer is the country’s largest lender in terms of loans, deposits and AuM. 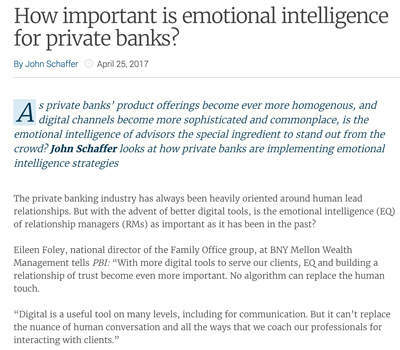 Founded in 1932, BBVA Bancomer private banking concentrates on three main client’s segments, that encompass the affluent ($100,000- 1m), private banking ($1m-10m) and UHNW ($10m and above) units. 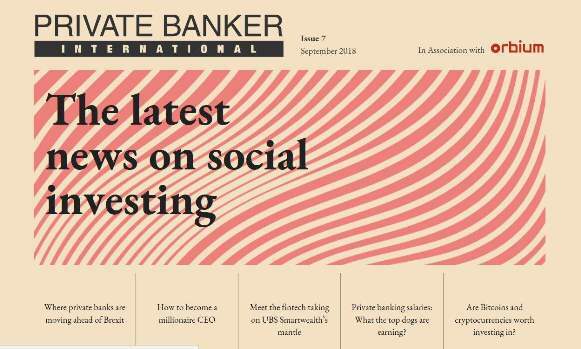 The private bank has doubled its assets in the last three years and currently manages $50bn in assets under management (AuM) in the three client areas, says Javier Diez Jenkin, director of private banking at BBVA Bancomer. 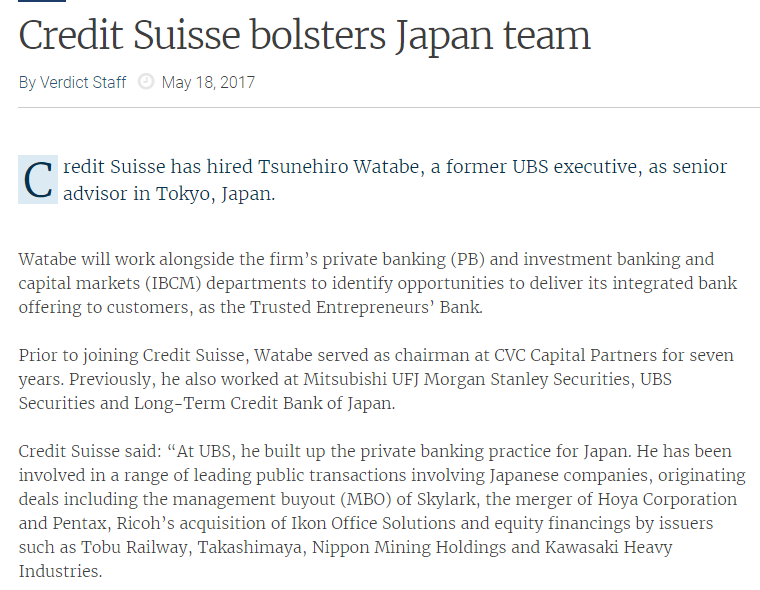 "The focus of private banks in the past was mainly on investments. Now we have to deal with the whole balance sheet of the customer." In Mexico, AuMs have been growing at approximately 15% annually over the last five years, Diez explains. BBVA Bancomer has a "unique model" in the industry because it has been focusing on both the financials and the non-financials for clients, including services around luxury travels, healthcare, and education, says Diez. "We have been bringing the world to the Mexican families," Diez says. There were 2,573 UHNWIs in Mexico in 2013 – they had an average wealth of $147m, making them a prime target group for wealth sector professionals, says Wealth- Insight. UHNWIs accounted for 1.8% of the total Mexican HNWI population in 2013 that is significantly higher than the global average of 0.7%. "In Mexico we have around 20% of Latin America’s UHNWs. Mexico is the secondlargest holder of UHNWs after Brazil," says Diez. However, Mexico is not far from catching up with Brazil in terms of the super-rich. WealthInsight expects the number of UHNWIs in Mexico to increase by 11.7%, to reach 2,951 in 2018. This will include 22 billionaires, 298 centimillionaires and 2,631 affluent millionaires. Billionaire wealth increased by 185.9% between 2009 and 2013, rising from $53bn to $152bn, according to WealthInsight. The total wealth of Mexican billionaires is expected to grow by 18.1% to reach $185bn by 2018. Diez says 80% of UHNWIs are located in Mexico City DF (Distrito Federal), which hosts 8,555,500 people including 62,667 HNWIs and 1,113 UHNWIs. WealthInsight research reveals that in 2013 there were also sizable UHNWI populations in Monterrey (121), San Pedro Garza Garcia (102) and Guadalajara (99). 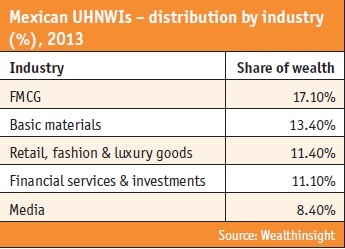 Manufacturing is the primary source of wealth for Mexican UHNWIs (17.4%), according to WealthInsight. Also, 17.1% of Mexican UHNWIs acquired their wealth through the fast-moving consumer goods (FMCG) industry in 2013 – higher than the 16.0% recorded for Mexican HNWIs. Basic materials accounted for 13.4% of Mexican UHNWI wealth, followed by retail, fashion and luxury goods with 11.4%, financial services with 11.1%, media with 8.4%, and transport and logistics with 7.9%. Diez says most UHNW wealth is not earned, but has been inherited. WealthInsight also reports that earned wealth made up for only 21% of Mexican UHNWI wealth in 2013, while 43.2% of Mexican UHNWI wealth in 2013 was inherited with entrepreneurial wealth also accounting for a significant 35.8%. 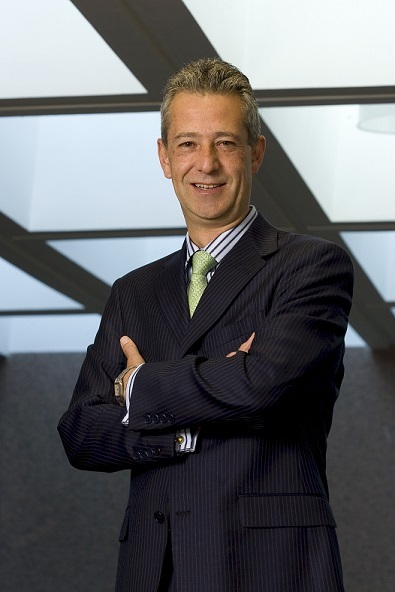 Only six months ago, BBVA Bancomer launched a new UHNW proposition. Since then it has grown exponentially to reach $2bn in AuM, Diez says. The bank is further expected to open two other offices in Monterrey and Guadalajara by the summer of 2015. The UHNW segment of BBVA Bancomer serves 500 families with more than $10m in investable assets. Though still immature, family offices are currently deepening their offerings in Mexico to prepare for increasing competition, especially from non-wealth managers entering the sector, says BCG. BBVA Bancomer’s model for UHNW is closer to become a multi-family office though in Mexico it is not a very common business model, Diez explains. Diez says: "We are trying to help families plan and transfer their wealth to the next generation. We also help them select their relationship managers (RMs)." In December 2013, Mexican President Enrique Peña Nieto signed a law pushing landmark energy reforms that will open up Mexico’s oil and gas sector to private investment. As noted in a Credit Suisse report earlier in 2014, the reform "represents the most important structural change for the Mexican economy since signing of the NAFTA in 1993". "Mexico is currently in the process of demonopolising the energy industry, offering opportunities for wealth in renewable energy sources", says Tom Carlisle, analyst at WealthInsight. Diez adds that the opening up of the energy sector is garnering a lot of foreign investments. "Mexican investors are also coming on board as we are issuing more products in this sector," he says. 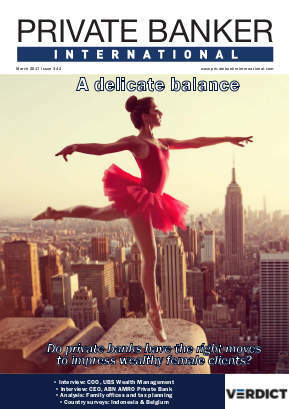 Analysing HNWIs’ investment preferences, Julius Baer’s first Latin America report launched in October 2014 revealed that though investors have become younger and more sophisticated over the past decades, cash, fixed-income and real estate investments still represent 76% of the average Latin American asset allocation. Diez says private equity investments were "very quiet" and now "are making a lot of noise around". "We are now in a joint venture with investors around the world and BBVA Bancomer is finding the more appropriate vehicles to do that," he says, explaining that liquidity is abundant in Mexico. BBVA Bancomer’s estimates show that Mexican HNWIs’ portfolios are made up 30-35% in equity, 12% in derivatives/alternatives products, and 30% in cash and 10% in real estate. With more Mexican HNWIs repatriating wealth, investments outside the country have been in a descending mode. Allocations to Europe declined from 25.9% in 2009 to 23.7% in 2013, and investments are expected to fall to 22.1% by 2018. On the other hand, Mexican HNWIs continue to invest in emerging economies, especially in the Asia-Pacific area. WealthInsight reports that allocations to the Asia-Pacific region increased from 10.9% in 2009 to 18.1% in 2013. This is expected to increase further over the forecast period, to reach 22.9% by 2018, the firm also predicts. "In Mexico we have around 20% of Latin America’s UHNWs. Mexico is the secondlargest holder of UHNWs after Brazil," says Javier Diez Jenkin, director of BBVA Bancomer private banking. 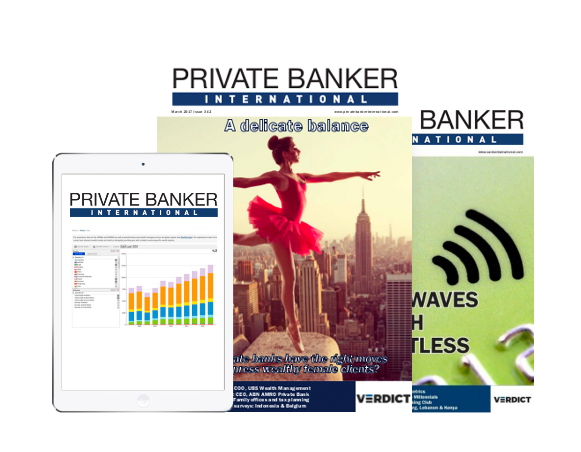 In the wake of the 2009 financial crisis, many Mexican private banks suffered only minor setbacks compared to private banks in Europe and North America, resulting in many banks around the world looking to invest in Mexico and its local stock market. The financial crisis, in particular, impacted the wealth of individuals who invested in foreign assets, and many have sought the advice of wealth managers and financial advisors to eliminate any future risk. Wealth repatriation is considered one of the reasons of growth of HNWIs in the country. "We have more than 500 companies listed in Mexico," says Diez. Through the Sistemas Internacionales de Cotizaciones, an index in the Mexican stock exchange, investors can trade on many funds and ETFs internationally without having to take their money outside the country, Diez adds. Mexico’s relations with strong economies such as the US and Brazil have also created further confidence in the country’s private banking market, with it being the first Latin American country granted membership to the OECD. Foreign Account Tax Compliance Act (FATCA), particularly, has made a prominent impression on Mexican private banking operations, as the country has signed a deal to become more transparent in providing HNWIs’ bank details to combat tax avoidance by US citizens. This has created a higher level of transparency in the sector, but has also reduced the level of funds that are deposited there, as many American HNWIs are rejected for services in Mexico. 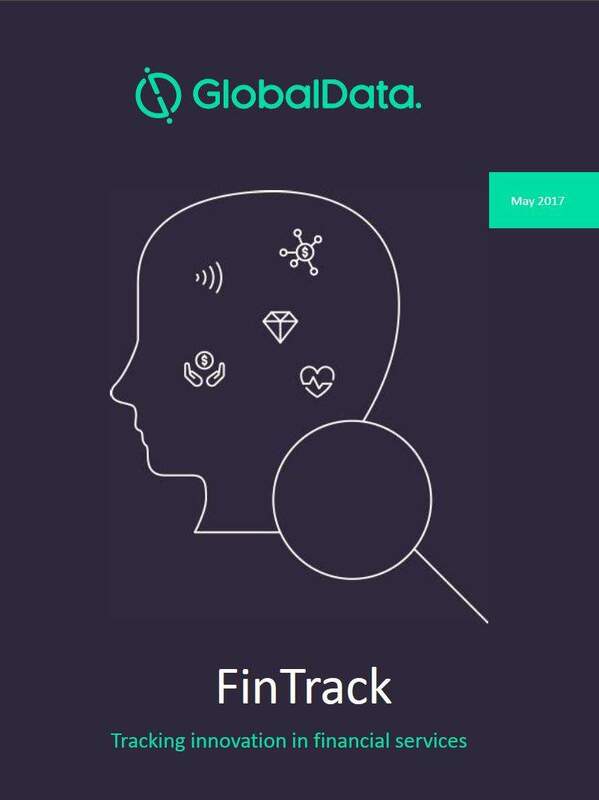 These tactics, however, have led to a high percentage of HNWI wealth being managed by domestic private banks, most of which are majority-owned by foreign private banks, WealthInsight finds. Diez concludes: "We are in the middle of the biggest business turn-around Mexico. The industry is broadening and more clients are bringing their money back to Mexico." With the onshore market expanding at a fast pace, BCG says local wealth managers will need to strengthen their offerings, segmentation services, and "weed out the long tail of small clients".